Mary Catherine Claybourn, known by many as “Aunt Kit,” was born on 17 August 1839 to William Divine Claybourn and Frances Alla Hawker. It is believed she was born in Tennessee because her parents did not come to Jefferson County, Illinois, until after her birth. She lived most of her life near Divide, Illinois, east of the town of Texico. Kit married (1st) Joe Boggs on 17 December 1857. According to his military enlistment papers Joe was five feet, six inches tall, with black hair, hazel eyes and fair complexion. Together Kit and Joe had three children, but as listed below none of them lived to maturity. Joe fought in the Civil War with Company H of the 80th Illinois Volunteer Infantry Regiment. This is the same unit where two of his brothers-in-law served, James Harrison Claybourn and William Pratt Claybourn. The company saw substantial action in the conflict, most notably on the front lines of the Battle of Perryville. However Joe fell ill in the spring of 1863 and died of disease on 5 April 1863, just before the unit set out on Streight’s Raid in Northern Alabama. Near the end of the war, on 22 January 1865, she married (2nd) Sam Starnes, the brother of her step-mother Elizabeth Starnes Maxey. [Sam Starnes was born on 11 April 1839 in DeKalb County, Tennessee. Much of the information regarding Samuel and his children with Kit comes from the generous contributions of Patricia Brown in 2013.] Sam had previously been married to Mary C. Crowder, who died in 1864, and together they had three children. 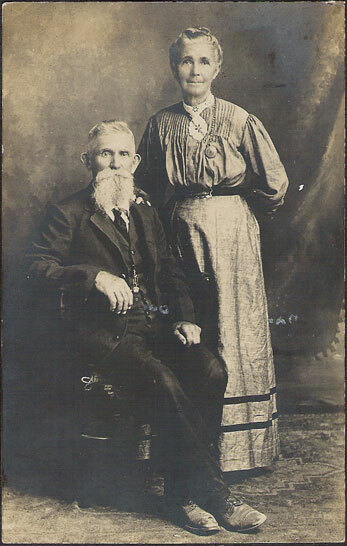 [Sam and Mary Crowder married on 7 October 1858 in Jefferson County, Illinois. She was born on 23 February 1840 in Illinois and died on 6 August 1864 in Jefferson County. She is buried there in Old Union Cemetery. Their oldest child was Ida Starnes, born in about 1859. Their second child was Mary Ada Starnes, who was born on 18 March 1861. She married William Ellis Donoho and they had three children. Their third child was Nettie Starnes, born on 27 February 1863 and died on 8 July 1881. She did not marry.] Sam was a prosperous farmer who had good painted buildings, a spacious yard with grass and trees, and orchards. He and Kit had eight children together, all listed below. Aunt Kit died of cancer on 13 February 1910. Samuel STARNES claims no marriage but asks for a divorce. The pretended marriage took place in St. Louis on February 17 this year of Gertie CLARK, daughter of G. B. CHILTON. A decree for divorce from Gerald CLARK was granted at last term of court and has never been filed. Charges fraud, deception and adultery. In the 1920 census Gertie and her sons are living in Wyandotte County, Kansas. Her last name is Newland and she is listed as a widow. Sam died on 12 November 1925 and he is buried together with Kit in Jefferson County. Harriet M. Boggs was born on 16 November 1858 and died shortly thereafter on 28 December 1858. Joseph M. Boggs died on 2 September 1861. Alla L. A. Boggs was born in August of 1863 and died on 2 September 1864. Willie Starnes was born on 16 April 1866 in Jefferson County and died roughly a year later on 9 July 1867. He is buried in Jordan Chapel Cemetery. Drucy Alva Starnes (a twin girl nicknamed “Bob”) was born on 25 April 1868 in Jefferson County, Illinois. On 24 September 1885 she married (1st) George Elmer Whitlock (born in 1865). They had one daughter, Lela, and divorced in 1893. [George Whitlock died decades later on 17 February 1943.] On 6 January 1895 Drucy Alva married (2nd) to Samuel Delbar Wise (born 7 May 1875). They had four children together, all listed below, before Drucy Alva died on 21 July 1944. Samuel died on 21 July 1961 in Schuyler County, Illinois. Leta Maude Whitlock was born on 8 August 1886 in Jefferson County, Illinois. On 1 March 1904 she married her second cousin William Spencer Claybourn. He was born on 18 April 1884 as the second child of Joseph Monroe Claybourn. They had ten children together. Additional details on their lives and children are available in the biography of William. Leta died on 24 December 1921 and William died on 14 June 1935 in Washington County, Illinois. They are buried in Jordan Chapel Cemetery in Jefferson County. John Jacob Wise was born on 1 June 1896 in Wayne County, Illinois. In about 1916 he married Dot Clemons (2 May 1897 – 11 January 1945). They had one daughter and divorced after the 1920 census. John married second to Goldie Myrtle Neal (1896-1989), previously married to Mr. Hardy, on 1 August 1927 in Fremont County, Iowa. As of his World War II draft card, they were living in rural Rushville, Schuyler County, Illinois. John died on 15 December 1987 in Schuyler County. Charles Edward Wise was born on 8 March 1901 and died soon after on 28 June 1902 in Cass County, Illinois. Arthur Leroy Edison Wise was born on 21 June 1905 in Cass County, Illinois. On 26 September 1922 in Schuyler County, Illinois, he married Maydee Perkins (1898-1981). He was step-father to her first child and then they had three children together. Arthur died on 9 July 1980 in Fulton County, Illinois. They are buried in Bader Cemetery in Schuyler County. George Gruber Wise was born on 24 February 1907 in Cass County, Illinois. He married Flossie Florine Ogden (“Florine”) on 15 February 1929. She was born on 12 October 1909 in Fulton County, Illinois. They had four children. George died on 3 September 1981 in Fulton County and he and Florine are buried there in Woodland Cemetery. Lula Bell Bush was born on 8 January 1893 in Jefferson County, Illinois. She married Speedy Johnson (1886-1953) on 27 November 1910. They had three children in Jefferson County, but she left before 1920 and he raised the children himself with help from his mother. She later married James Jacobs and lived with him in St. Louis City, Missouri. She died there on 13 October 1955 and is buried with her mother in New Saint Marcus Cemetery. Laurel S. Bush was born on 10 November 1894 in Jefferson County, Illinois. He was a private in the U.S. Marine Corps during World War I. On 22 July 1923 he married, in St. Louis, Missouri to Marie Irene Pawlikowski (born 10 April 1904 in Russia). They had one son. Laurel died on 12 January 1955 and Marie died on Oct 22, 1996, both in St. Louis, Missouri. They are buried there in Jefferson Barracks National Cemetery. Laurel M. Bush was born on 5 June 1931 in St. Louis City, Missouri. He too served in the military, starting in February 1953 and was a Major in the U.S. Army in Korea. He was owner and operator of one of the early Kentucky Fried Chicken restaurants in the St. Louis area. He opened his first KFC restaurant in 1962 in Ferguson and subsequently opened three other restaurants in the Belleville area and was active in those businesses until his death. He was a former board member of the National Kentucky Fried Chicken Purchasing Co-op and of its national advertising committee. Laurel died on 11 May 1995 after suffering a heart attack. John B. Bush was born on 14 November 1895 in Jefferson County, Illinois. He was a private in the U.S. Army during World War I. In about 1919 he married Sophia DeMartini (born 10 April 1897 in St. Louis, Missouri). They had one daughter and divorced before 1930. John died on 4 April 1941 and Sophia died on 27 September 1951, both in St. Louis. John is buried in Jefferson Barracks National Cemetery in St. Louis County, Missouri. Beulah A. Bush was born on 9 April 1899 in Jefferson County, Illinois. Before 1935 she married George J. Wilkerson (1908-1978) and they were living in St. Louis City, Missouri. He served as a private in the U.S. Army. She died on 8 April 1978 in St. Louis City and they are both buried in Jefferson National Barracks Cemetery in St. Louis County, Missouri. Raymond Earl Bush was born on 15 February 1901 in Jefferson County, Illinois. He was a private in the U.S. Army during World War II. At the time of his enlistment he said he was divorced with dependents, but his dependents are unknown. Raymond died on 8 July 1979 in St. Louis, Missouri. He is buried there in Jefferson Barracks National Cemetery. Edward Bush was born in about 1903 in Jefferson County, Illinois and died in April of 1959. He is buried in the New Saint Marcus Cemetery in St. Louis, Missouri. Clyde E. Bush was born on 27 May 1905 in Jefferson County, Illinois. In about 1924 he married Claudia Boultinghouse (born in about 1906 in Daviess County, Kentucky). They had one son together. Clyde died Oct 9, 1928 in St. Louis, Missouri and Claudia died sometime after 1940. Clyde is buried in the New Saint Marcus Cemetery in St. Louis. Claudia’s date of death and place of burial is not known. Brady William Bush was born on 3 February 1907 in Jefferson County, Illinois. He was a private in the U.S. Army during World War II. At the time of his enlistment he was single with no dependents. Brady died on 27 September 1966 in Missouri. He is buried in Jefferson Barracks National Cemetery in St. Louis. Jewel Bush was born on 4 July 1910 in Jefferson County, Illinois. She married a Mr. Divine after 1920. Jewel died on 14 September 1939 and is buried in the New Saint Marcus Cemetery in St. Louis. Samuel D. Starnes (“Sammie”) was born on 27 August 1870 in Jefferson County, Illinois. On 11 November 1891, in Jefferson County, he married Rosa L. Hawkins (born on 17 April 1877 in Jefferson County). They had nine children. Samuel died on 6 December 1947 and Rosa died on 6 October 1961, both in Salem, Marion County, Illinois. They are buried there in Zion Grove Cemetery. Roy E. Starnes was born in June of 1893 and died at a young age in 1900 in Jefferson County, Illinois. He is buried there in Jordan Chapel Cemetery. Frank P. Starnes was born on 6 August 1895 in Jefferson County, Illinois. In about 1923 he married Eunice J. Rains (born 11 August 1899 in Williamson County, Illinois). Frank died on 28 July 1979 and Eunice died on 4 November 1987 in Rockford, Illinois. They adopted one child, Fern. Charles H. Starnes was born on 24 April 1900 in Jefferson County, Illinois. He married Eula Lydia Beaty (1901-1991) in about 1921. Newspaper articles mention them with a daughter named Fern. Charles died on 2 November 1990 in Salem, Marion Co, Illinois. He and Eula are buried there together in East Lawn Cemetery. William Edward Starnes was born on 14 October 1902 and died on 27 November 1923 in Jefferson County, Illinois. His death record says he was a taxi driver. He did not marry. He is buried in Jordan Chapel Cemetery in Jefferson County. Ira H. Starnes was born on 27 December 1904 in Jefferson County, Illinois. He married Mable Gregory (1910-1981) in about 1925 and they had one son, Harold Eugene Starnes (1925-1997), then divorced in about 1931. She married again shortly thereafter to Ivan Gersbacher (1906-1986). He moved back with his parents, then enlisted in the U.S. Army in Chicago on 3 October 1942. After his service, he married Nettie Ruth Hadden (1893-1972), widow of Guy W. Presgrove (1890-1930) and they lived in Dixon, Lee County, Illinois. After her death he moved back to Jefferson County where he died in Mt. Vernon on 16 October 1986 and was buried in Zion Grove Cemetery in Marion County. Nettie died on 3 February 1972 in Lee County, Illinois. She is buried in Iuka Cemetery in Marion County. Fred Dean Starnes was born on 28 November 1908 in Jefferson County, Illinois. On 29 July 1930 he married Chloe Inez Donoho (born on 14 October 1908 in Marion County, Illinois). They had one child. Fred died on 11 January 1975 and Chloe died just months later on 20 May 1975, both in Marion County. Fred Dean Starnes and his wife are buried together in East Lawn Cemetery in Marion County. Glenn Starnes was born on 21 October 1910 in Jefferson County, Illinois. In about 1931 he married Irene Nellie Myers (1909-1997). They had one son, Robert Edward Starnes (1931-1998), who served in the U.S. Navy from January 1951 to November 1954. Glenn died on 10 June 1944 in Salem, Marion County, Illinois. Irene later married World War II veteran Leroy Vaughn (1912-1963). Glenn and Irene are buried together in Zion Grove cemetery in Marion County. Mary A. Starnes was born on 13 June 1913 in either Jefferson County or Marion County, Illinois. She married Gleason A. Osborn (1907-1995) on 21 December 1932. Gleason passed away in November of 1995. Gleason passed away in November 1995 and Mary died on 26 June 2001 in Salem, Marion County, Illinois. They are buried together in Zion Grove Cemetery. Harley D. Starnes was born on 26 June 1915 in either Jefferson County or Marion County, Illinois. He was a Private first class in the HQ TRP4 Constab Regiment during World War II. Harley died on 25 June 1965 and is buried at Zion Grove Cemetery in Marion County. Rosa C. Starnes was born on 4 September 1872 in Jefferson County, Illinois. On 26 December 1889 she married William Henry Howell (born 27 August 1868 in Marion County, Illinois). They had four children. Rosa died on 10 June 1907 and William died on 22 December 1940, both in Marion County. They are buried there in Zion Grove Cemetery. Rosazettie Howell was born on 28 October 1891 in Marion County, Illinois. She did not marry and died on 10 January 1912. She is buried with her parents in Zion Grove Cemetery in Marion County. Everett Juel Howell was born on 26 January 1892 in Marion County, Illinois. On 25 February 1919, in Iroquois County, Illinois, he married Nellie May Noonan (born 15 December 1897). They had six children. Everett died on 5 January 1949 in Los Angeles, California and is buried in East Lawn Cemetery in Marion County. Nellie died on 26 November 1985 in Dallas County, Texas and is buried in Moore Memorial Gardens Cemetery in Tarrant County, Texas. Mary Jane Howell was born on 18 November 1893 in Marion County, Illinois. In about 1911 she married Charles Morton Harvey (born 11 February 1892 in Marion County). They had two children, then divorced during the 1930’s. Charles died on 20 November 1955 in Marion County and is buried there in Zion Grove Cemetery. Mary died on 21 December 1967 in Monterey, California, but her place of burial is not known. Robert Hulin Howell was born on 14 July 1905 in Marion County, Illinois. On 25 November 1927, in Spokane, Washington, he married Louise May Hill (born on 25 April 1908 in Malheur County, Oregon). They had three children. Robert died on 6 January 1945 in Bingham County, Idaho. Louise died on 17 August 2000 in Cherokee County, Georgia, where she had been living with her second husband. Robert Hulin Howell is buried in Sunset Memorial Park cemetery in Twin Falls County, Idaho. His wife’s second husband, William Clifford Akers (1906-1996) is buried in Macedonia Memorial Park cemetery in Cherokee Co, GA, but her place of burial is not known. Morton D. Starnes was born on 3 April 1875 in Jefferson County, Illinois and died about two years later on 13 November 1877. He is buried in Jordan Chapel Cemetery in Jefferson County. Francis D. Starnes was born on 13 December 1876 in Jefferson County, Illinois and died on 15 November 1877, two days after his brother Morton, in Jefferson County. He is buried there in Jordan Chapel Cemetery. Catherine F. Starnes (“Katie” or “Kate”) was born in November of 1878 in Jefferson County, Illinois. On 13 December 1894 she married David Parker (born 20 November 1873). They had three children. David died on 29 March 1953 and Katie followed in 1956. They are buried in Zion Grove Cemetery in Marion County, Illinois. Various articles in the Mt. Vernon News-Register from 1954 indicate that Kate was bedridden as of around the time of her husband’s death in 1953. Her three daughters took turns caring for her, either in their homes or hers. There was a mention of an ambulance ride to or from Port Arthur, Texas, where Daisy lived. Maude Belle “Maudie” Parker was born on 19 September 1895 in Marion County, Illinois. On 19 November 1911, in Jefferson County, Illinois, she married Roy Lihu Sollis (born 8 September 1891). They had one son. Maudie died on 24 March 1969 in Texico, Jefferson County. Roy died on 5 May 1981 in Jefferson County. They are buried in Zion Grove Cemetery in Marion County. Daisy Mae Parker was born on 27 January 1899 in Marion County, Illinois. On 16 August 1920 she married Harry W. Rains (born 7 April 1898 in Williamson County, Illinois). They had one daughter. Harry died on 29 January 1979 and Daisy died on 19 October 1991. They are buried in Zion Grove Cemetery in Marion County. Essie I. Parker was born on 11 September 1910 in Marion County, Illinois. In about 1927 she married first to Elmer F. Hoskins (1903-1990). They had two sons, one dying in infancy. In the 1950s the family was living in Beech Grove, Marion County, Indiana, while making occasional visits to their Marion County property. [Elmer married second to a widowed family friend, Eloise Whitlock McDaniel (1908-1999) on 6 October 1972 in Marion County, Illinois. He is buried alone in Zion Grove Cemetery.] On 31 August 1962 in Marion County Essie married second to James A. Morris (1910-1996). Essie died on 23 July 1986 in Mt Vernon, Jefferson County, Illinois. She is buried with her second husband in Zion Grove Cemetery in Marion County.